I have a big, honkin' board on Pinterest titled: Cool + Exciting Garden Ideas. It mostly consists of creative and functional garden-art ideas as I consider my backyard an extension to my indoor art studio. When I pounce upon a pin that excites me–like the pinned picture at left, I follow up with a YouTube search for a tutorial on how to re-create the idea. Upcycling is a passion of mine so the clever transformation of colorful rainboots into planters really excited me. I mean it looked so easy and cheap to make. But recreating isn't always as easy as a YouTube tutorial may appear, whether it's a humble amateur video or one filmed by a professional outfit, I've learned a) The tutorial presenter isn't interested in creating the object for longevity or 2) Steps are often skipped because someone else behind the scenes did the hard prepping part, so don't let the cute flicks of children crafting something you intend to make fool you. 1. First thing, you need a pair of discarded rainboots. Last Fall I found a gorgeous pair at a church sale, then over the winter I found some reasonably priced ones on eBay and at Goodwill a Tagsale and Craigslist. Our solarium where I piled the boots smelled like a pungent swim cap until Spring arrived and we could slide the windows open. But first PAY ATTENTION when purchasing rainboots, check for condition, it's okay if they look worn, but the Goodwill ones had a busted buckle on one boot that I overlooked. I cut the buckles of this pair off, but if you're looking to make and re-sell your rainboot planter, inspect the boots with laser- focused eyes. 2. Secondly, one needs to drill holes in the bottom of the boot for drainage. Sounds easy huh? Well guess what! Most rain boots have metal reinforcements in the soles. Yeah, not so easy to drill through. Most YouTube tutorials showed wee little drill holes on the sides and/or bottom of the boots. The small drill bit holes didn't funnel water well when I tested for drainage by pouring water in the boots, some retained a lot of the water for a very long time. So I had to re-drill with a larger bit, and that's when I hit metal. The drill will drill through the metal reinforcement, but this isn't child's play. I opted for one larger hole instead of several, like a flower pot. 3. BEFORE DRILLING remove the insteps inside boots. Also some rainboots are lined and the first small drill bit I used got twisted up in the lining to the point the boot started rotating like a propeller, dislodging the drill from boot wasn't easy, thus another reason to use a large drill bit and make just ONE big hole. Also be careful to not drill through to other side of boot. 4. Use a sturdy cushion like the plastic Styrofoam block to left to rest boot on when drilling, otherwise you might drill a hole right through the table. Like. I. Did. 5. Next step, hold boot up to sky to make sure you drilled through the whole sole. You can use a knife or scissors to enlarge hole if need be. Then grab a few handfuls of peastone and toss in, using hands is faster than a small cup or hand shovel. 6. 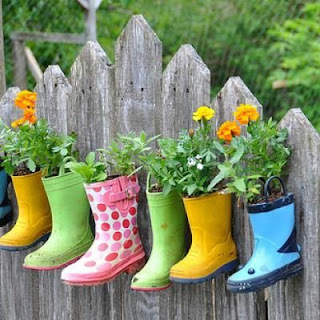 Add Potting Soil to boots, NOT Topsoil, potting soil is lighter and best for drainage in contained spaces. Trust me on this. Don't fill all the way to the top as you need room to put flowers in. So this project also points out you need Peastone, potting soil and flowers-this is a fun project but not uber cheap to produce. But still, whimsical and unique compared to a pedestrian Terra Cotta pot. 7. Add flowers, and voila! Ye are finally done. Come winter in colder climates, I suggest storing boots in garage or basement–someplace dry– to preserve them for future enjoyment. So I recommend planting annuals in your boots rather than perennials. Enjoy!